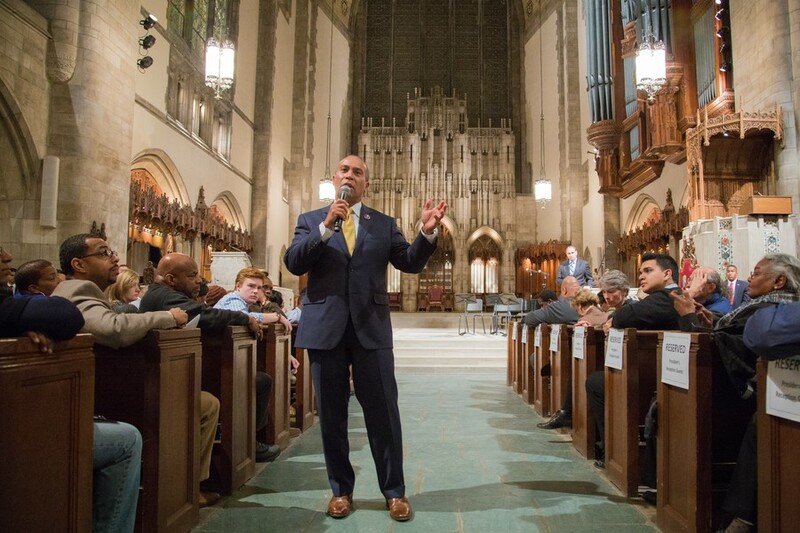 Massachusetts Governor Deval Patrick called for a widespread commitment to public service during his keynote address at UChicago’s 24th annual Martin Luther King Commemoration Celebration at Rockefeller Memorial Chapel on Wednesday night. A native Chicagoan, Patrick grew up in the Robert Taylor Homes housing project on the South Side during the height of the civil rights movement. His childhood, Patrick reflected, shaped his understanding of the value of service. The Harvard Law School graduate went on to work for the NAACP Legal Defense and Education Fund and later served as U.S. Assistant Attorney General for Civil Rights. Patrick focused his speech around one of King’s most acclaimed teachings: an ingrained sense of service to one another. “Dr. King taught us that service is power. Transformative power. We need hearts filled with grace, and souls carried by love. One thing I try to do is to elevate this value, to draw attention to the power of service,” he said. Patrick also outlined his own attempts to instill this sense of service in young people, citing Project 351, an initiative aimed at celebrating Massachusetts’s youth service leaders. “I gathered together an eighth grader from every one of the 351 cities and towns in the Commonwealth who were themselves service leaders. I figured the athletes and scholars and artists had channels to flourish and be recognized for it, but not always the service leaders,” he said. Especially in addressing national issues such as income inequality and the endangered “American Dream,” Patrick said that finding lasting solutions would require some heart. “Making opportunity real requires action. You can reason your way to practical solutions, but without love, you cannot fully appreciate why addressing them is a matter of real urgency,” he said.